I’ve read on a few blogs (James White and Justin Taylor) about the upcoming “debate” on October 1, 2011 between Dan Wallace of Dallas Seminary and Bart Ehrman on the topic “Can we trust the text of the New Testament?” I recently read and am in the process of writing a book review for an upcoming issue of ATI of Robert B. Stewart, Ed., Bart D. Ehrman & Daniel B. Wallace in Dialogue: The Reliability of the New Testament (Fortress Press, 2011). This book came from the Greer-Heard Point-Counterpoint Forum in Faith and Culture that was held at New Orleans Baptist Theological Seminary on April 4-5, 2008. 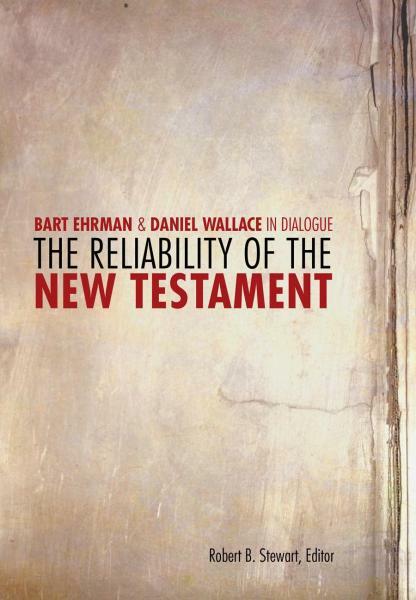 This forum included a “dialogue” (not a “debate”) between Wallace and Ehrman on the “The Textual Reliability of the New Testament.” The book contains a full transcript of the 2008 Wallace-Ehrman Dialogue including their presentations and the q and a session with the audience. It also includes seven scholarly articles from the likes of Michael Holmes and David Parker, leading academic text critics). 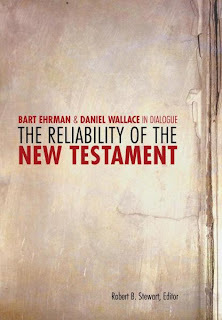 As the title indicates the central focus of the forum, and therefore the book, was the dialogue between Ehrman and Wallace. Ehrman is clearly the rock star in this dialogue. He is a self-described former evangelical who claims that his faith ran aground when he discovered the uneven history of the textual transmission of the New Testament as a graduate student at Princeton. Ehrman went on to write the groundbreaking scholarly work The Orthodox Corruption of Scripture (Oxford University Press, 1993), which argued that orthodox scribes altered the transmission of the text of Scripture to suit their polemical purposes. He has since written a series of popular works on text criticism and Christianity that have attacked the authority and reliability of Scripture (e. g., Misquoting Jesus). Wallace is much less well known outside evangelical circles, but he is considered the foremost evangelical New Testament text critic of our day. As evidence of this, Wallace was asked to present one of only two plenary addresses to the 2008 meeting of the Evangelical Theological Society when the annual theme was on textual criticism. The second plenary address was by Peter Gentry on Old Testament text criticism. From his opening remarks, it is clear that Wallace is in awe (envy?) of Ehrman’s professional accomplishments. At times he almost fawns over Ehrman (cf., e. g., his opening lines: “Bart, as I expected, your presentation was energetic, informative, and entertaining. It was vintage Bart Ehrman” [p. 27]). In the audience q and a, Wallace actually states, “I think that what Bart has done for the Christian community is a great service” (p. 47). His point is that he admires Ehrman for exposing not just the general population, but also Christians, in particular, to disputed textual issues in the New Testament like the comma johanneum (John 7:53—8:11). From an orthodox position, however, it strikes one as strange that Wallace would so enthusiastically praise a man who has so brazenly attacked and attempted to undermine the authority and reliability of Scripture. Certainly civility should be the rule for such interactions, but Wallace goes beyond good manners and essentially capitulates to Ehrman. One of the more bizarre moments recorded in the dialogue also came from the q and a when an audience member asked Wallace about the propriety of preaching from John 7:53-8:11. Wallace responded, “Those are great and very practical questions that Bart can answer far better than I, so I’ll turn to over to him” (p. 57). Ehrman then gave the deadpan reply, “No. I would not preach on that.” The transcriber adds: “Audience roars with laughter” (p. 58). It is hard to figure what Wallace was thinking in deferring to Ehrman, a hardened apostate and agnostic, a question about preaching. Was he trying to be coy, humorous, cute? Though the audience laughed, it was hardly amusing. The transcript of the dialogue between Ehrman and Wallace comes off, in the end, rather flat. Few sparks fly. There is little heat or passion expressed in disagreement. The key reason for this is that Ehrman and Wallace actually have very little to disagree about when it comes to textual criticism of the New Testament. Both, in fact, are confirmed “reasoned eclectics” (as are all the other authors in the book) who embrace the modern critical text of the New Testament as descended from liberal Protestant scholarship of the 19th century forward (as represented by scholars like Westcott and Hort, Nestle, Aland, and Metzger). No doubt, a much more stimulating exchange would have resulted if either (or both) men would have entered into dialogue (debate?) with a proponent of the Majority Text or of the Textus Receptus or even a King James Version Only-ist. Both Ehrman and Wallace agree, for example, that disputed passages in the traditional text like the comma johanneum (John 7:53-8:11) and the so-called longer ending of Mark (Mark 16:9-20) were not part of the authentic, original text of the New Testament. So, Ehrman says John 7:53-8:11 “was not originally in the Bible” (p. 24) and that Mark 16:9-20 was added by later scribes (p. 25). Wallace, likewise, says that the woman caught in adultery is his “favorite passage that’s not in the Bible,” and he agrees with Ehrman that the traditional ending of Mark “is not part of the original text of the Bible” (p. 29). 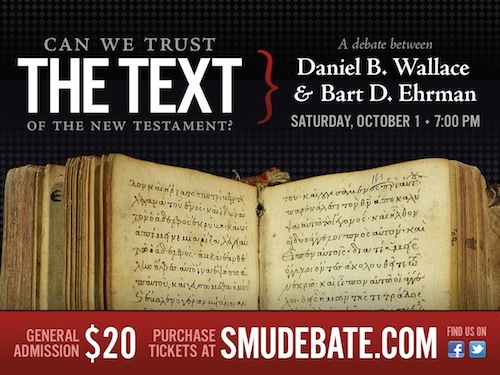 "Is the text of the New Testament reliable? The reality is there is no way to know. If we had the originals, we could tell you. If we had the first copies, we could tell you. If we had copies of the copies, we could tell you. We don’t have copies in many instances for hundreds of years after the originals. There are places where scholars continue to debate what the original text said, and there are places where we will probably never know" (p. 27). "So, is what we have now what they wrote then? Exactly? No. But in all essentials? Yes" (p. 46). Thus, both agree that it is impossible to reconstruct the original text of Scripture with absolute certainty. Where do they differ? Ehrman suggests that we simply do not have enough evidence to know what the original text of Scripture contained, and so we must remain agnostic and skeptical. Thus, he can continue to muse about orthodox corruptions. Wallace, however, suggests that while we do not have (and never will have) absolute certainty about the original text of the New Testament we have a modern reconstruction that is close enough for Christians to trust and rely upon. Note: Interested readers might also like to read my series of blog article reviewing Dan Wallace's ETS Plenary Address on NT Text Criticism (part one, two, three, four, and five). "he admires Ehrman for exposing not just the general population, but also Christians, in particular, to disputed textual issues in the New Testament like the comma johanneum (John 7:53—8:11)." Please come out of the woods and look back in history. Dear people we have known that John 7:53 and ff is not original before Dr. Bart was even born. Everybody thinks that Dr. Bart discovered discrepencies--he is LAST to the table. There is more evidence in what he does not talk about than what he does talk about. If you are a follower of Dr. Bart, you get a tiny glimpse into modern textual criticism and practically nothing from history that is meaningful.